We all go through periods when our skin gets dehydrated and/or breaks out, whether its from changes in weather/climate, stress, hormones, or a combo of these. Or maybe, you’ve suffered most of your life from excess sebum/pimples or other skin conditions. Whether it’s a chronic condition or a temporary thing, its key to give love to your skin on a regular basis. I’m a big believer in focusing on NATURAL REMEDIES if/when possible, as they aim to treat the root cause, and generally don’t have side effects. (And I personally have seen their effectiveness vs. prescription and over-the-counter products). Even if you wish to continue taking stronger/prescription products, natural DIY beauty solutions are often a great added plus (just make sure to check with your doctor). To keep our skin healthy, it’s important to consider our skin microbiome (yep, just like our GUT, our skin has a microbiome), which is filled with good and not-so-good bacteria. Keeping our good bacteria strong (and bad bacteria at bay) is key for healthy, nourished skin. The great news is that it's super easy to do all this right from home - and it's cheap, too! Natural DIY face masks are a great "facial" option that can work wonders on your face in just minutes, and are great especially if you can't make it every month to your facialist. Plus, you can do them while multitasking! So today I wanted to share one of my favorite face masks – great for all skin types - that will help you keep a healthy skin microbiome and restore a healthy glow in your skin. Honestly the feeling once you wash this off is amazing! COCONUT YOGURT adds healthy probiotics to your skin microbiome (yes that’s a thing, see above!). Recent studies are starting to show that probiotics, used topically, can work similar magic to your skin than they do in your gut, reducing skin inflammation from the outside. Also, yogurt contains zinc and lactic acid (a natural hydroxyl acid) that help dissolve dead skin and tighten pores by gently exfoliating your skin, and the beneficial fats in the yogurt help to overall nourish your skin. RAW HONEY has an anti-inflammatory effect, it helps exfoliate skin and adds beneficial enzymes. Plus it has antifungal and antimicrobial properties which can calm redness and irritation, cleanse pores, and soothe and heal skin (addressing acne, eczema, or even burns/injuries). Lastly, honey improves skin tone, texture and can improve dryness and wrinkles, given its natural antioxidant and moisturizing properties. Note: if you can’t find manuka honey, just make sure your honey is RAW (unpasteurized) and ideally local and organic. APPLE CIDER VINEGAR balances your pH and fights bacteria and acne. Also, it contains alpha hydroxy acids that help remove dead skin and even help fade both age spots and acne scars. 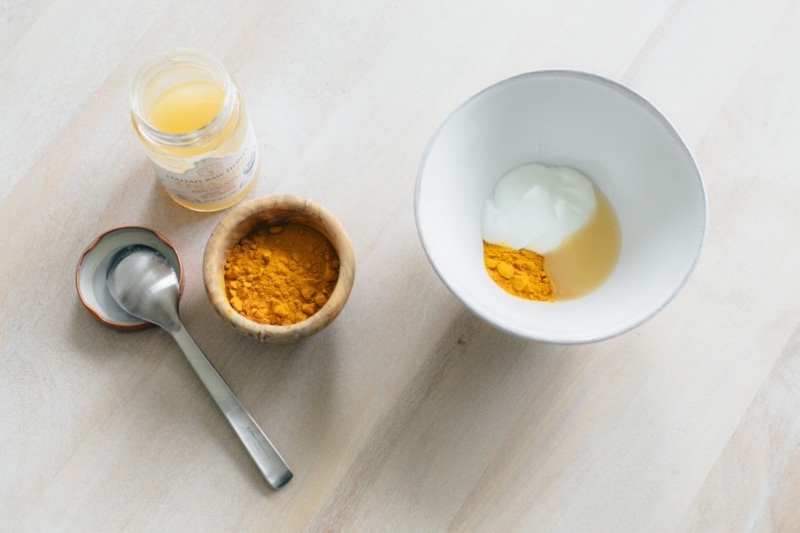 TURMERIC is incredible at purifying and cleansing the skin, resulting in a healthy, bright glow. But mostly, it’s great for acne due to its antiseptic and antibacterial properties, which fight pimples, breakouts and clogged pores. Instructions: Place all the ingredients into a small bowl and stir them together until they form a smooth mix, then rub the mask over your face, creating a generous layer. Wash your hands well. Leave the mask on for 10-30 mins, you'll feel it dry, then gently wash off with a washcloth soaked in warm water until your face is completely clean. (Note: if you have leftover mask mix, save the extra in a small sealed glass container in the fridge to apply later in the week). Bonus tip 1: If your skin is extra dry, add 1 tsp of olive oil to the mask. Bonus tip 2: For extra exfoliation, add 1 tablespoon of oats with a bit of warm water as you begin to remove the mask, gently mixing the mask with the oats to exfoliate, then fully remove with warm water. NOTE: The turmeric is hugely beneficial but optional. Personally, my skin can easily get orange as I already consume lots of orange fruit/veggies and turmeric, so if I'm applying this mask more than once a week, I’ll skip the turmeric the 2nd time around, or use less turmeric, and the mask still works wonders. (And when I do use 1 tsp turmeric, I leave the mask on for no more than 15 minutes).